NASHVILLE, Tenn. (WTVF) — NewsChannel 5 continues to follow our city on the rise to empower you, as your neighborhood changes. Nashville city planners think the "Pikes" are the next big areas for development and growth. This week they're working on a future plan for Dickerson Pike (also known as Dickerson Road), covering everything from building heights to what the road should look like. Like the rest of Nashville, the Dickerson Road area has seen change. Just ask Omid Yamini, who moved there back in 2007. "When I moved on to that street, houses were selling for $50,000 or less in some cases. Now we've got half a million dollar houses," he said. Like many others, he didn't mean to be ahead of the real estate curve. "I'm not a real estate investor, I'm not a money man, I'm just somebody that needed somewhere to live," he said. City planners say the change is not surprising. Dickerson Road is close to downtown, has great skyline views in some areas, and has easy access to the interstate and other major roads like Ellington Pkwy and Briley Pkwy. And they say a reputation for crime in the area that may have stymied growth in the past is fading. In the past three years, residents and businesses have invested more than $50 million in real estate just on Dickerson Road itself, according to Metro planning records. But staff expect much more in the future. And say there are things the city can do to help. 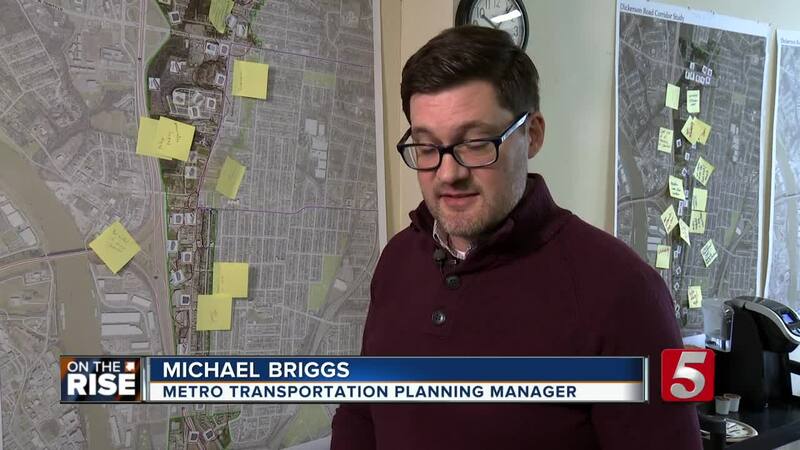 "There could be some zoning changes to help stimulate development," said Metro Transportation Planning Manager Michael Briggs, talking about changing ordinances to allow for buildings 7-12 stories tall closer to the interstate. Planners are talking about even taller buildings than that close to the Trinity Ln interchange. But they're making an effort throughout the process to get feedback from residents like Yamini. This week they held a series of workshops and meetings and invited the public. "We got feedback for what heights would be appropriate," Briggs said. Residents helped design some of the final maps, outlining areas they want to maintain the same in blue and places they'd like to see change in red. Yameni says he wants things like grocery stores, transit and amenities. And in fact has wondered why it's taken so long for the area to re-develop. However he does have concerns. A big one: affordability. "It's bittersweet in some ways I think Dickerson Road has some rich history and personality that I hope isn't wiped away and sterilized," he said. The street itself is a debate: should there be bike lanes, bus-only lanes, crosswalks or parking? So far signs point to a plan that emphasizes increased buses on the road. "What would bus rapid transit line look like through here," Briggs suggested. It's a balance. And it's one the city says can happen, but it will take a village to drive it. City planners will present their final plan tomorrow at the Trinity United Methodist Church at 5:30 p.m. You can also view it at www.DickersonRoadStudy.nashville.gov. Then in the Spring, the Planning Commission will consider any proposed changes to city ordinances.